Skye Gravestones | Lachlan & & Flora (Macqueen) Nicolson & family. Lachlan & & Flora (Macqueen) Nicolson & family. 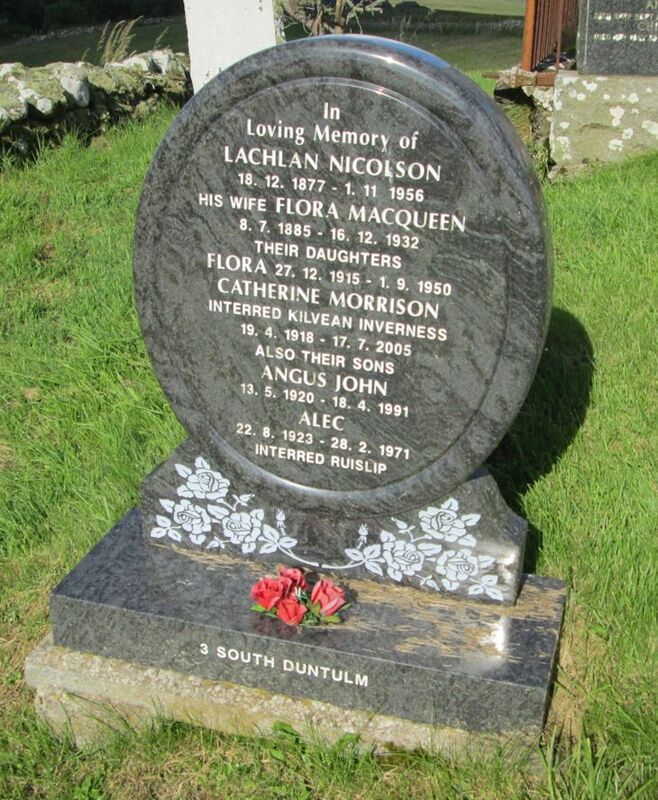 In/loving memory of/LACHLAN NICOLSON/18.12.1877 - 1.11.1956/his wife FLORA MACQUEEN/8.7.1885 - 16.12.1932/their daugthers/FLORA 17.12.1915 - 1.9.1950/CATHERINE MORRISON/interred Kilvean Inverness/19.4.1918 - 17.7.2005/also their sons/ANGUS JOHN/13.5.1920 - 18.4.1991/ALEC/22.8.1923 - 2.8.1971/interred Ruislip.